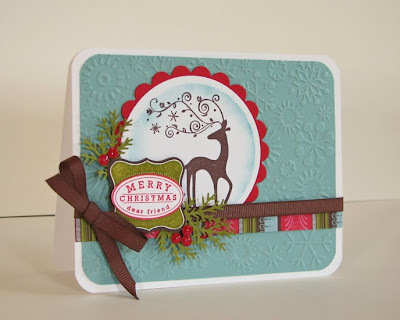 Cardstock, stamps, ink, ribbon, patterned paper, curly label punch: Stampin' Up! Another stunning card, Amy! Makes me want to scrap. Totally inspiring. Holy crap, that is beautiful!! Simply amazing. Thanks for joining us at Caardvarks this week ... another fantastic sketch design ... ♥ those punched leaves and the sponging around the circle. What an adorable card - love this! 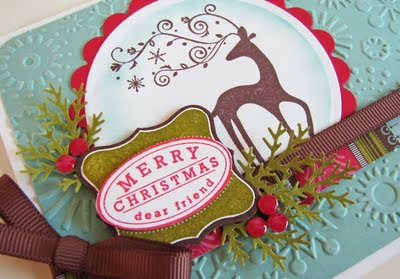 this is a really really beautiful Christmas card, I love all the little details. Absolutely LOVE it! It's simply perfect! Oh my, truly beautiful card today! oh WOW! it's not often that i see a card and want to *COPY* it exactly in every single detail...but holy moly this is one, for sure!!! there's nothing to even consider changing, altering or embellishing...it is absolutely perfect and SO VERY lovely!!! simply beautifull. Love all the dimensions! Oh my, this is just stunning! As were all of your Sketchfest cards! gorgeous work! This is stunning! I love your card. omg!!! What a great card!